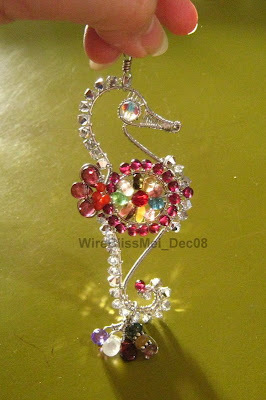 This wire wrapped seahorse pendant is another piece that took me long time to complete - almost whole day. The shaping of the seahorse frame took the longest time. 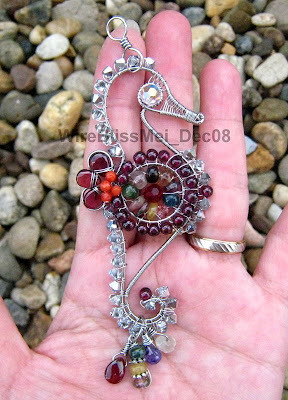 Finally completed this pendant this evening. Matching earrings to go but that would be for later or tomorrow. This sea horse looks very pregnant don't you think so? Hehe! Its a custom order and I hope the new owner would love it as much as I do. Length - about 7cm from top to bottom. 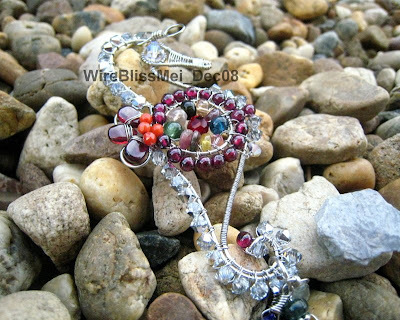 Stones - garnet, tourmaline, Swarovski crystals and corals. Wire - 20ga for the frame and 28ga for weaving and coiling. I especially love the colors of the tourmaline (centre) when the sunlight shines through them. That is amazing! I believe that it took a whole day - it would have taken me two! I'm sure the customer will be thrilled! i really like this seahorse so much..
Mei What a lovely sea horse. I find your work amazing...it's beautiful! You really should write tutorials! Thanks PastelGuy, Corra, Yati, Terib! Tutorial will go to my "to do list". Wow that list is getting longer and longer. Have a wonderful Christmas and Happy New Year all! Mei...this is just beautiful, your work is amazing, your customer will be thrilled I'm sure! !